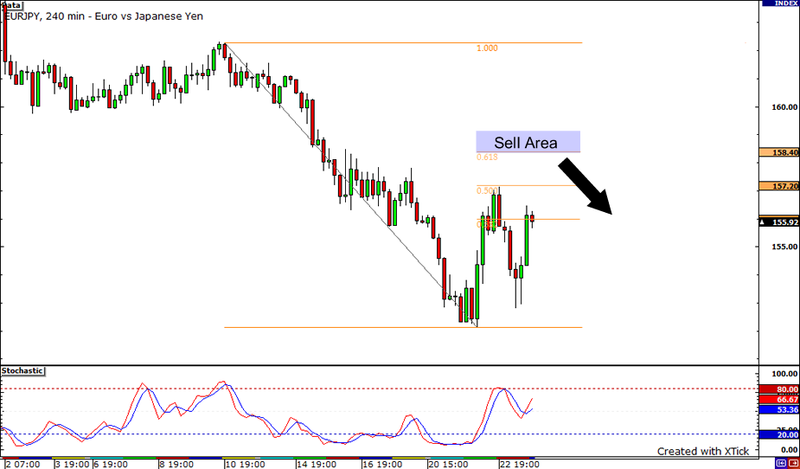 The remaining portion of our position closed out yesterday as EUR/JPY rallied back after finding support at 155.50. Since my last update, EUR/JPY hit 156.35 where we trailed our stop once again to 157.35. It fell almost another 100 pips to 155.35, but found support at 155.50, so we didn’t get to trail our stop one last time. EUR/JPY is currently running into sellers at this point at 158.00, so we may see it move lower once again if 158.00 holds. Friday’s momentum took EUR/JPY higher where it found a wall of sellers at 159.00 before falling back down past our entry point and hit our first profit target. Adjust stop on remaining position to breakeven. We will trail our stop by 100 pips. Stay tuned for further updates and adjustments! Good luck! We have entered our short position as EUR/JPY has risen as risk appetites have grown this week. Momentum is still strong to the upside, so we’ll have to watch our position very closely. Stochastics on the 4hr are now in overbought territory, so hopefully we’ll see the pair run out of steam, and see some sellers step in. Tomorrow is a light economic day, as well as next week, for the Euro and the Yen, so we may see movement on US data as it seems to dictate global risk appetite in today’s market environment. Stay alert and stay tuned….Good luck! Hello fellow Forex traders! It’s been a couple of days since we got out of our trade as we rode EUR/JPY on risk aversion, and now it’s riding high once again as traders take on risk after reports of US insurer bailouts. Is this a reversal or a pause from the downtrend? I think the rise in risk appetite we’ve seen in the past couple of days may be short lived with more rate cuts on the horizon from central banks and fears that the US may slow down global growth. With a quick look at the 4hr chart, we can see that risk aversion is the overall sentiment, and it may continue after the retracement as we see sellers hold off buyers in the 156.00 to 157.00 range. I think the major news events of the past couple of days (central bank rate cuts and talks of bond insurer bail outs) will push riskier plays (aka carry trades) just a bit higher in the next day or so. If we do see a push above 157.00, I think there will be a lot of traders ready to sell some Euros and buy back some Yen.. I look to step ahead of the 61% Fibonacci retracement level drawn on the chart. Stochastics are not quite in overbought territory which leads me to believe that the current momentum to the upside hasn’t quite run out of steam just yet. Remember to never risk more than 1% of your account on any single trade. Adjust positioin sizes accordingly. If we do get triggered and if the trade goes our way, hopefully we can roll it into a longer term play. Stay tuned for updates and adjustments. Good luck!